I have no original thoughts on art. They are all borrowed from Roger Scruton. McLaren: What do you think of Jackson Pollock? McLaren: But he’s a genius. Gibbs: Interesting you say that. If you were in a conversation with someone who said he wasn’t a fan of Shakespeare, what would you reply? Gibbs: Yes, I would say the same thing. I would defend Shakespeare simply by asking the other fellow if he had any experience with Shakespeare. The assumption, of course, is that Shakespeare’s genius is obvious to anyone who has encountered him. However, when someone disparages Jackson Pollock, no one defends him with, “Haven’t you seen Autumn Rhythm?” Rather, they simply leap to the assertion that Pollock was a genius. It’s a tacit admission that his genius cannot be proved by his artwork alone. Why do you think that is? McLaren: Pollock’s work is complex. Gibbs: So was Shakespeare’s work, but you claim Pollock’s work is complex. Complex compared to what? McLaren: It’s complex in and of itself. Gibbs: Are you using the word “complex” as a compliment? McLaren: Because complexity is more of an achievement than simplicity. Gibbs: So, you don’t think highly of artists like Mark Rothko or Franz Kline? McLaren: What makes you say that? Gibbs: Compared to Pollock, their work is astoundingly simple: just two colors and a few more-or-less straight lines or geometric shapes. McLaren: No, I think their work is quite complex, as well. Gibbs: Could you offer an example of a non-complex piece of art? Gibbs: There’s far more to Kinkade’s art than to Pollock’s, though. 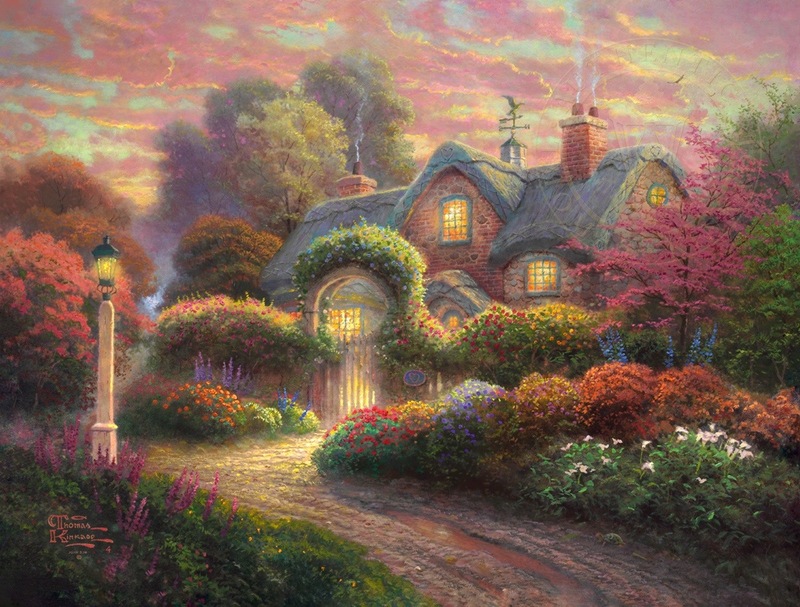 Gibbs: There’s more color in Kinkade’s work, not to mention a greater variety of shape, texture, pattern, line. McLaren: That doesn’t make Kinkade more complex. Gibbs: So where is the complexity of Pollock’s work located? Gibbs: That does not make him a great artist. He might have been a great thinker, but if he couldn’t get his thoughts onto the canvas, he wasn’t a great painter. McLaren: I would say he got his thoughts onto the canvas, though. Gibbs: What thoughts are those? McLaren: Have you ever read an essay on Pollock’s work? Gibbs: Do I need to in order to understand his work? Gibbs: Can his art not speak for itself? McLaren: His art only spoke to certain people. Gibbs: Did he try to speak to all people or was he only speaking to a select few? McLaren: He was only speaking to a select few. Gibbs: Did he know how to speak to common people? McLaren: He was a genius. His ideas weren’t going to make sense to common people. Gibbs: But the critics who interpret Pollock’s art can make sense of his art for the people whom Pollock couldn’t reach. Gibbs: Then the critics are the real geniuses, because they both understand Pollock’s art and they can make sense of it to the people Pollock couldn’t reach. McLaren: They didn’t come up with Pollock’s style, though. It was wholly original. Gibbs: What do you mean by “original”? McLaren: I mean no one had ever done what Pollock did before. Gibbs: And what did Pollock do? McLaren: You’ve seen a Pollock painting, right? Gibbs: Yes, I just want to hear you describe Pollock’s style. McLaren: I mean… he dripped and splashed and splattered paint on canvas. Most people think the splashing and dripping was random, but it’s not. If you look closely at his paintings, there’s an order to it. 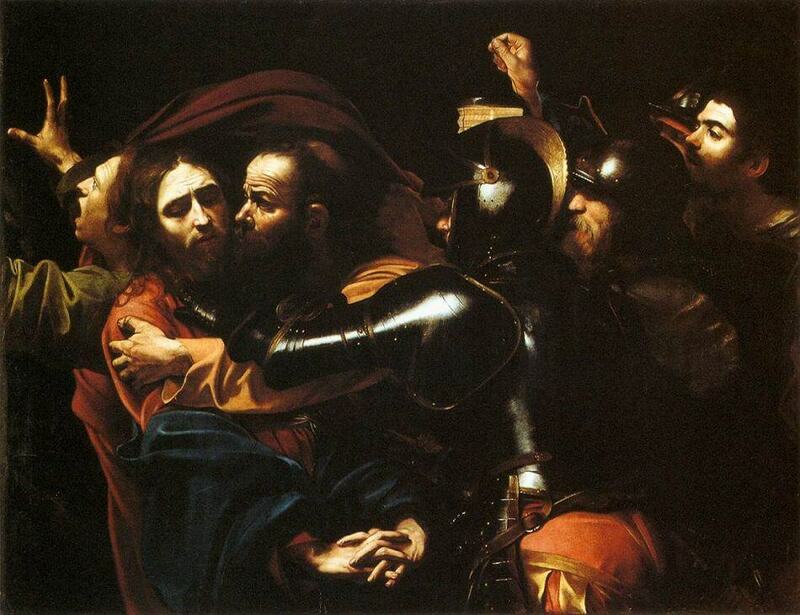 Gibbs: One need not look closely at a Caravaggio to see there is order to it, though. You can see the order from a good distance. Caravaggio ordered his paint to look like human beings in the midst of terrible anguish, sublime rapture, and deep contentment. How did Pollock order his paint? McLaren: Well, Pollock would often start by painting dark black bones which would anchor the rest of the paint. All the other splashes were based on these strong, thick pylons that held together the splashes and drips and so forth. Gibbs: I’ve heard that, as well. If a man watched Caravaggio paint the Madonna, and another man watched Pollock paint his lines and so forth, which observer would be more capable of creating a forgery of the master’s work? McLaren: Oh, the man who watched Pollock. Obviously. Pollock couldn’t paint human figures like Caravaggio. You’ll get no argument from me there. However, both Pollock and Caravaggio were great conveyors of emotion. Caravaggio could have done what Pollock did, but he didn’t. That’s what makes Pollock special. He did it first. It’s a bit like building a better mouse trap. After you see someone else’s design, you can copy it, but the prize goes to the one who came up with the idea. Gibbs: So, is there any point imitating Pollock’s work? McLaren: I think someone could be inspired to paint as passionately as Pollock, but I don’t think there’s any point in doing drips, splashes, and splatters like Pollock did. Gibbs: Then it’s not like building a better mouse trap, at all. If I copy someone else’s more clever design for a mouse trap, I can use the trap I’ve copied to catch mice. If Pollock was wholly original, as you suggest, and there is no point in imitating his work, then I don’t know to avoid the conclusion that Pollock’s work was isolated, lonely, and selfish. McLaren: That’s the way it is for geniuses. Gibbs: What precisely was Pollock’s genius? McLaren: What do you mean? Gibbs: I mean John Milton had a genius for poetry, St. Augustine had a genius for theology. As for Monet, I would say his genius was for catching light. Freidrich’s genius was landscapes. What exactly was Pollock so good at? McLaren: His work is emblematic of a highly significant turn in the history of painting. For Pollock, art was about self-discovery and self-expression. Gibbs: Perhaps, though you did not answer my question. So far as art goes, what was Pollock good at? McLaren: I don’t know why my answer wasn’t sufficient. Gibbs: Pollock was a genius. Pollock changed the game. Pollock was influential. None of this has anything to do with his paintings, though. 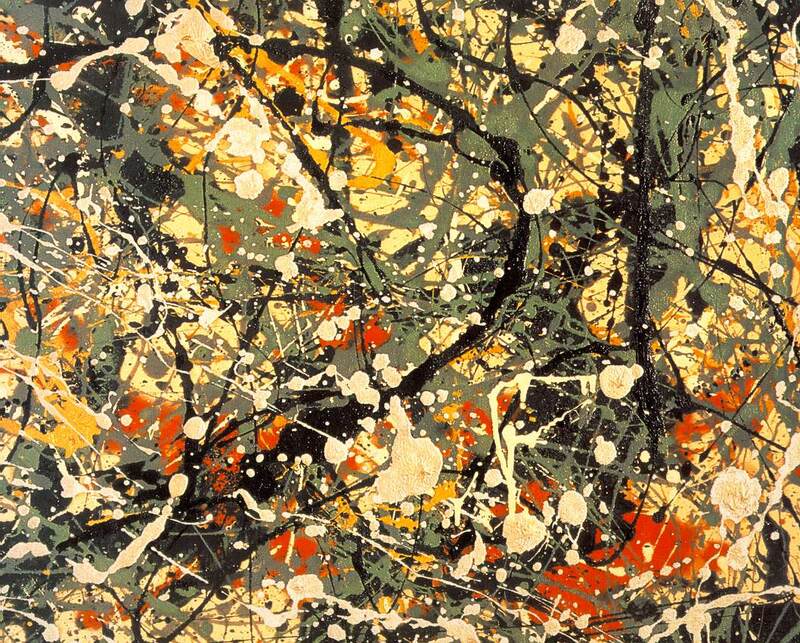 Over and over in the defense of Pollock, his paintings are superfluous. McLaren: Have you ever stood in front of a Pollock painting? McLaren: How did you feel? Gibbs: I wondered if the painting was upside down. McLaren: Very funny. He signed his name on the bottom right corner. Gibbs: Actually, he didn’t. He sometimes signed his name upside down on the top left corner. Gibbs: I don’t know, but it strikes me as the kind of thing which a “wholly original” artist might do. McLaren: So, you wondered if it was upside down? Anything else? Gibbs: The painting was big— the canvas, I mean. Physically large. This tends to be true of a lot of modern art, such as Transformers movies and Avengers movies which run on 3D IMAX screens. McLaren: Are comparing Pollock’s art with summer blockbusters? Gibbs: Modern art tends to be very sensual, which means that modern art typically depends on size. The intellectual and spiritual hollowness of something like Transformers or Jackson Pollock’s Mural (1943) is hidden by overwhelming the audience with chaos and spectacle. Pollock’s Mural is twenty feet long and eight feet wide and I’ll wager that Pollock knew that was the only way the painting would have any effect on anyone. Christians commonly carry miniatures of Christ or Mary around in their pockets or in charms on necklaces. A miniature of Mural would be entirely worthless, though. It only works on a massive scale. Any work of art with a soul does not depend entirely on size, for a soul has no size. Soulless things distract us from their soullessness by being large and loud and unsubtle. McLaren: When standing before one of his paintings, did you not also sense Pollock’s rage and his anger and his frustration and his desperate attempt to hold together all the disparate elements of the universe? Gibbs: No, but let’s assume for the moment I did. So what? McLaren: Is that not obviously valuable? Gibbs: It is not a praiseworthy accomplishment in itself. Why would it be? McLaren: I’m baffled. Is not so much great art about rage and anger and frustration? Is not most art about the desperate attempt to hold things together? 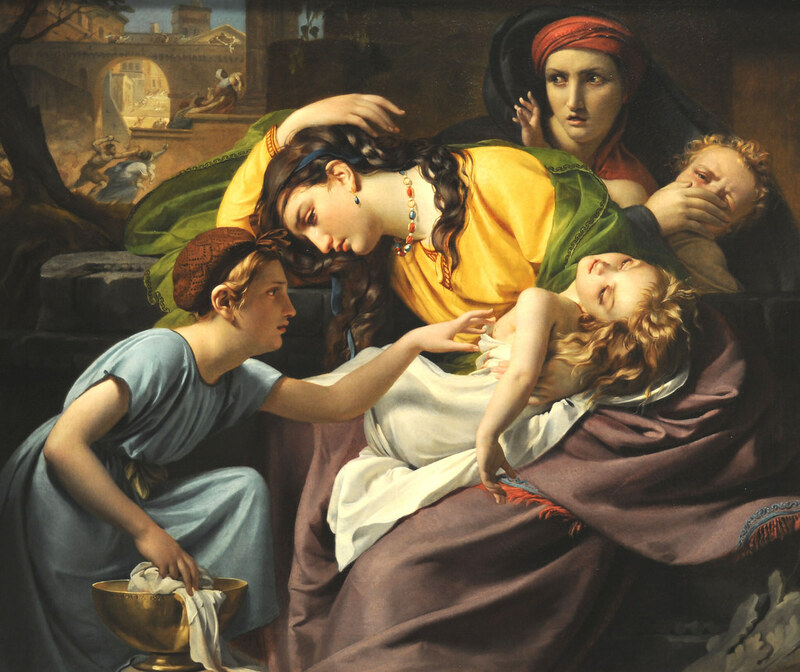 Gibbs: Take Francois-Joseph Navez’s Massacre of the Innocents, for example. Is there not rage and anger and sadness in this painting? The woman with the red headdress— is she not desperately attempting to hold things together? Is she not terrified she will lose her own child, but also grieving for her sister’s child, who has already been slain? McLaren: Yes, it’s all there. Gibbs: But this painting is not about rage and anger and sadness. It’s about human beings— historical human beings, who really lived and really suffered, and the painting catches these people in a moment wherein they are angry and sad over a very particular injustice and wickedness which afflicts them. Navez didn’t try to bypass the world in order to get to some abstraction of rage or some Platonic anger. For Navez, the world itself— creation itself— was what the artist must draw from. Navez does not draw from himself, he draws from others, and inasmuch as he protests the injustice of the slaughter he depicts, he reaches out to God. Yes, there is ugliness in the world. For inexplicable reasons, the Modern artists believes it is his job to reflect the ugliness and confusion in the world, which only increases the ugliness and confusion in the world. McLaren: Is that not what Navez is doing, though? Is he not reflecting historical suffering in his art? Gibbs: Heavens, no. He has not reflected human suffering. Inasmuch as Navez weeps alongside the woman who holds her dead child, inasmuch as Navez recoils from the ugliness of murder, Navez has not increased the amount of suffering in the world. He has begun redeeming the suffering. This is simply the task of every artist, from little children who paint families of apples trees to Matthias Grunewald’s depiction of the crucified Christ torn to pieces by ergotism. The fact there is ugliness in the world means art cannot simply imitate life, for doing so will only make the world uglier. Neither can art reflect suffering without multiplying suffering. Great art does not merely report on suffering. That's what the nightly news does. Great art redeems suffering. Great art redeems the world. Joshua Gibbs teaches great books to high school students at Veritas School in Richmond, Virginia. He is the editor of FilmFisher and has two daughters, both of whom have seven names. You can find him on Twitter @joshgibbs.